Ever have those days when it feels like no matter how much or how often you eat, you're still hungry? I don't love those days. I tend to be someone who eats small amounts every couple or few hours throughout the day...so, for me, smaller (but filling!) snacks are awesome. I love a "little something" that will tide me over until the next time I eat (and I don't like feeling hungry!). I even have what I call my "snack bin" at work in my office; it's a large rubbermaid container filled with healthy snacks that I can go to during the day if what I ate for breakfast or lunch isn't quite enough. 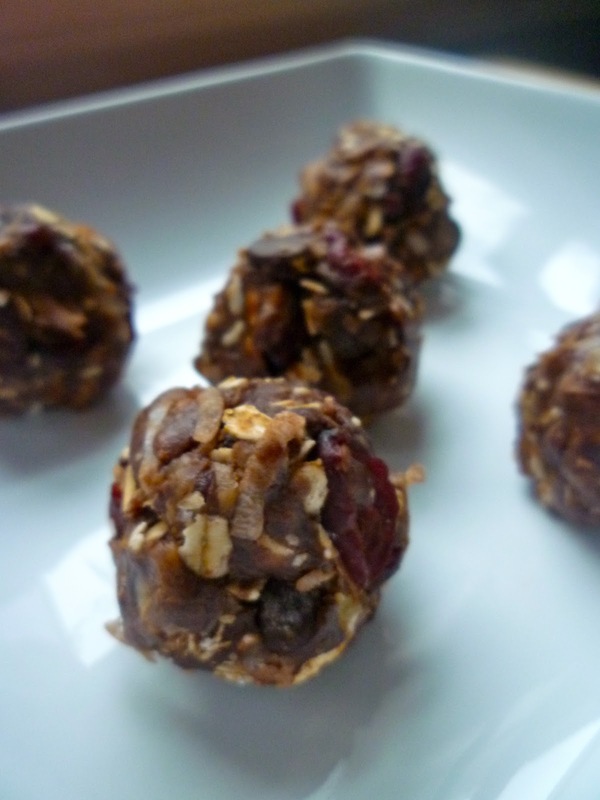 Now, these chocolate oatmeal cranberry energy bites wouldn't go in my snack bin at work (since they're stored in the fridge ;)), but they fit perfectly into this idea of a small snack that will help fill you up and make you last until your next meal! Just make sure you don't have too many at once... They are incredibly tasty, so there's a good chance you'll be tempted to eat several in a row! The recipe is adapted from My Blessed Life. I changed my version slightly from the original recipe, and I also halved it when I made these. For me, the proportions listed below made 12 bites. So, if you double it, you'll get a couple dozen! Next time, I definitely want to make the full batch, not just half! Mix peanut butter, honey, and vanilla in a medium bowl. Add remaining ingredients and mix together until evenly combined. If needed, use your hands to mix everything! Form mixture into 1-inch balls, using your hands. Store in an airtight container in a fridge for up to 1 week. 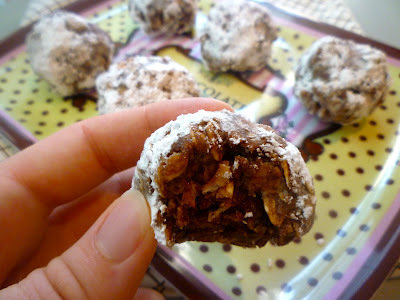 Makes about 1 dozen energy bites. The original recipe called for even amounts (1/2 cup of each) of walnuts, cranberries, and chocolate chips. As you saw above, I did not add the walnuts though; instead, I added about 1/3 to 1/4 cup each of cranberries and chocolate (remember that I halved the original recipe). This recipe definitely leaves room for changing it up, which I love. So feel free to add other ingredients that you might like! 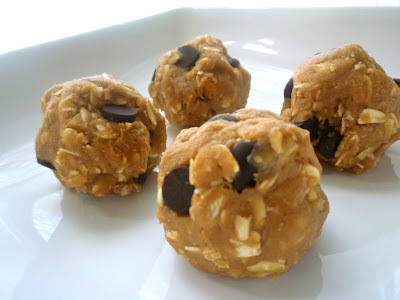 These are also a perfect little snack before going out for a run or working out. And they also make a great dessert! These treats are pretty sweet overall, but not too sweet! You may have noticed that I didn't have a Wedding Wednesday post for you this week. Oops! I just didn't have the time to get one together. But don't worry; these series will continue. It's not over quite yet!